Show 'em how it's done, Batgirl! Action-packed 11 1/2-inch tall statue on an awesome base. Add her to your Gotham City Garage collection today! The smash-hit Gotham City Garage statue line from DC Collectibles adds another heroine to its impressive lineup in the form of this action-packed Gotham City Garage Batgirl Statue. 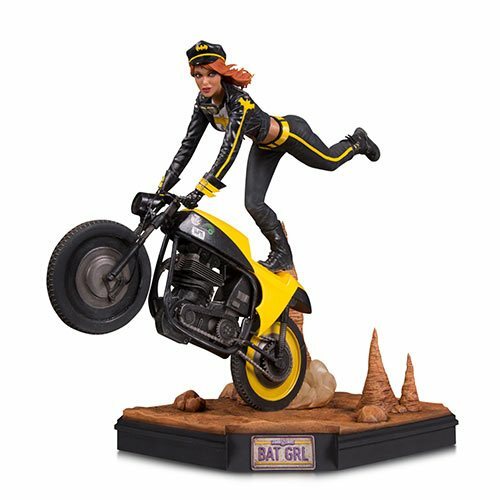 Batgirl shows off her acrobatic skills on her motorcycle in this unique polyresin statue that measures about 11 1/2-inches tall. And check out that awesome base! Ages 14 and up.